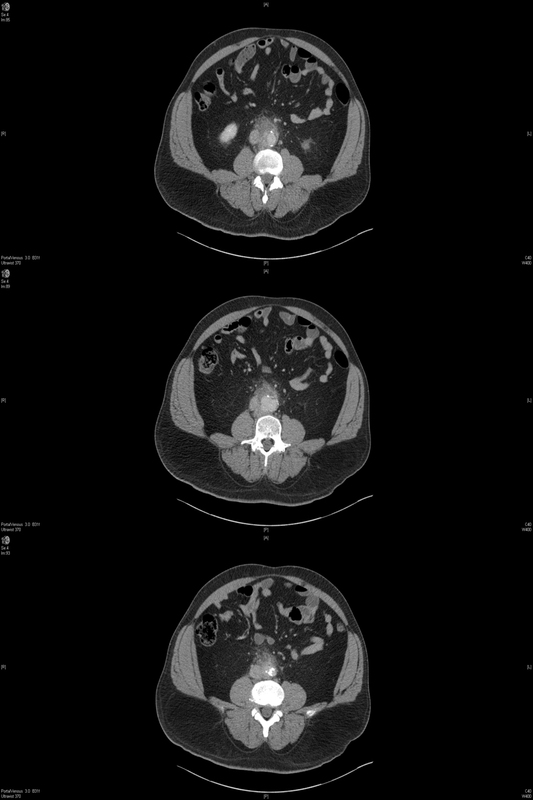 a 59 year old male presents to ED at 2am with a two week history of progressive back pain. He is worried because it is worsening in severity and now radiates to the left flank & left-lower quadrant. Two weeks of constant, progressive midline back pain (~L2 level). Much more severe over the past two days; required 20mg IV morphine pre-hospital to get comfortable !! Pain now radiating from left-flank to his left-lower quadrant. Reports feeling “hot & sweaty at night”, but no one has taken his temperature. No constipation, dysuria or urinary frequency. No leg weakness, numbness or difficulty mobilising. On-pump CABG (4-vessel grafts) two years earlier. His medications include aspirin, atorvastatin & metoprolol. Mild left lower quadrant tenderness, without peritonism. Well, our basic first-line investigations were unhelpful. Chest x-ray: no collapse or consolidation. no effusions. Urinalysis: No leukoesterases. No nitrites. Trace blood. 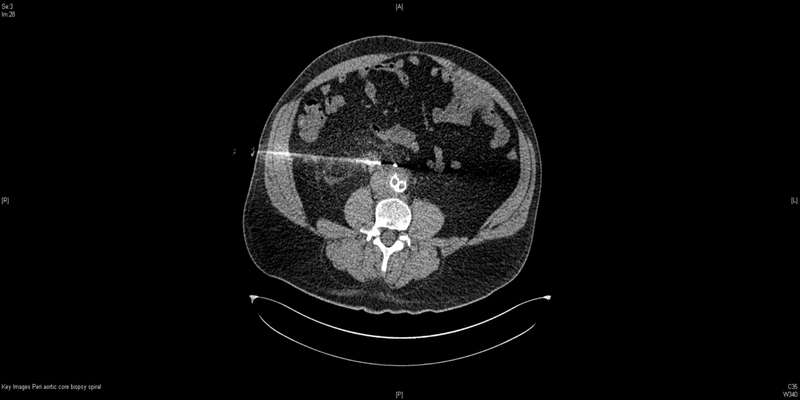 Abdominal x-ray: No air-fluid levels or abnormal gas patterns. However despite 2 litres of IV fluids, he remains tachycardic at 110. Unnerved by this & his yet unexplained fever; I convince him to stay & arrange a bed under the general physicians. Periaortic stranding with soft-tissue swelling & tangential calcification. Aorta measured to 30mm. Concerning for small aortic aneurysm rupture or impending rupture. DDx of aortitis. 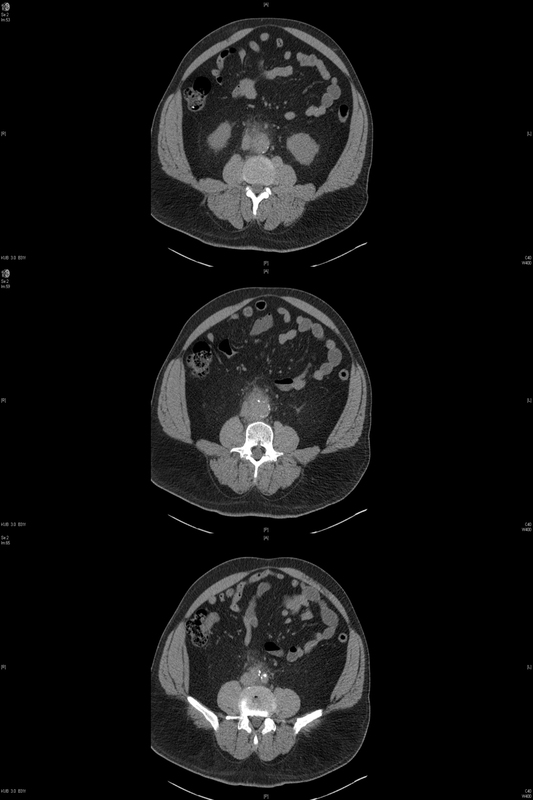 Eccentric aneurysmal dilatation of the infrarenal abdominal aorta. Surrounding soft tissue swelling & fat stranding suggestive of focal aortitis with associated mycotic aneurysm. “An all-encompasing term ascribed to inflammation of the aorta”. Most commonly large-vessel vasculitides (GCA) & Takayasu arteritis. A pre-existing aneurysm can become secondarily infected, but aneurysmal degeneration of the arterial wall can also be the result of infection, due to bacteraemia or septic embolisation (ie. mycotic aneurysm). including pneumonia, cholecystitis, UTIs, endocarditis, diverticulitis, soft-tissue infections or osteomyelitis. Contiguous infection vs embolic seeding (bacteraemia). Presence of atherosclerosis alone (especially in the elderly) is a risk for bacterial seeding. Large spectrum of symptoms & clinical signs. Upper &/or lower-extremity claudication with pulse deficits. Presenting complaint, symptoms & risk factors. Definitive diagnosis of aneurysm & suggests infection. Ultrasound – helpful in diagnosing aneurysm only. This will later by tailored to culture & sensitivity results. Urgent consultation with Vascular Surgery. Despite aggressive medical therapy, mortality associated with infectious aortitis remains high, largely owing to high rates of aortic rupture !! Surgical debridement +/- aortic aneurysmal repair. Immunosuppressive therapy is the primary treatment – consult your Rheumatologists. Prednisolone is mainstay of therapy. 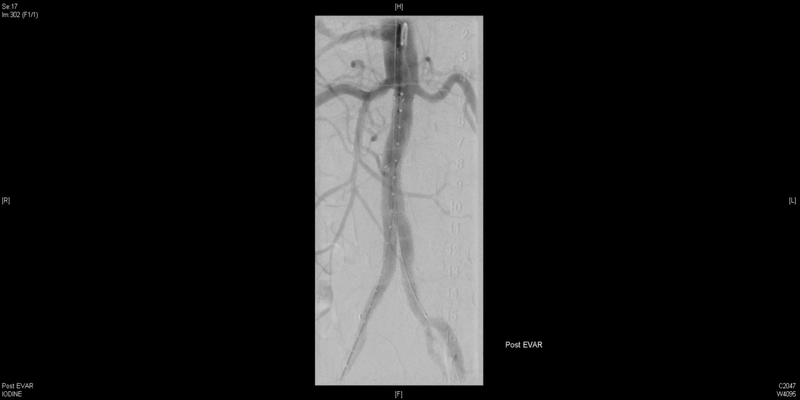 Still needs consultation with Vascular Surgery for consideration of surgical vs endovascular aneurysm repair. Post-operatively, our patient is taken to ICU for aggressive blood-pressure management. His transoesophageal ECHO showed no evidence of endocarditis. On day 3, he undergoes tissue biopsy/sampling with the help of interventional radiology. Peri-aortic biopsies = Salmonella !! He is discharged from hospital on day 8, with a PICC line & a long-haul of ceftriaxone therapy ahead of him !! Gornik HL & Creager MA. Aortitis. Circulation. 2008;117:3039-3051. 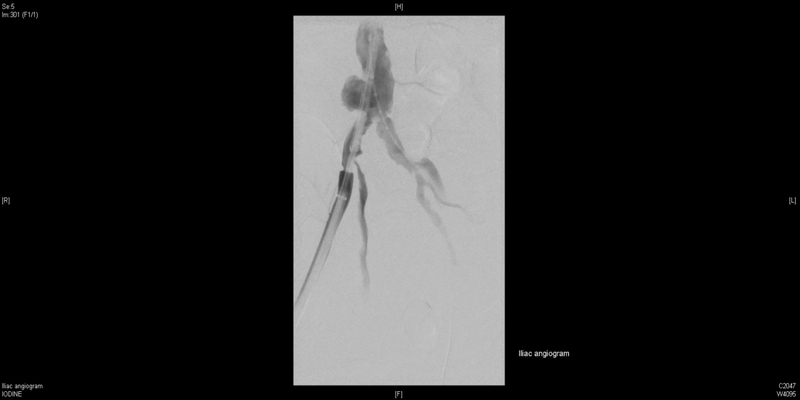 UpToDate.com – Overview of infected (mycotic) arterial aneurysm. Laohapensang K et al. Management of the infected aortoiliac aneurysms. Ann Vasc Dis. 2012;5(3):334-41. Wang JH et al. Mycotic aneurysm due to non-typhi Salmonella: Report of 16 cases. Clin Infect Dis. 1996 Oct;23(4):743-7.